I think I have reach a point where everyone but me seems to be moving on to another stage of their lives. My sister’s have both moved out in to their own houses, one is married for over two years and the other one is getting married in months time( say turned for updates on hen’s and wedding goodies!). My parents are reaching a stage were retirement or at least part time work is on the cards; I know my parents would never fully want to give up working but at least take some more time for themselves. Friends are continuing to do honours degrees or have a pretty good idea on what job they would like to obtain after university. Where does this leave me? I still hell confused on what I am going. Go on with my degree in order to gradate with a masters or if I chase my dream of being a fully accredited baker and seriously put some thought into partnering up with sister’s make up/wedding business (shameless pug: Their business is “Pretty creations” Here is link to the Website. They seriously good at what they do and I am not just saying that because I am their sister. This choice is growing ever closer as I enter my last year of a bachelor degree, but no closer to figuring out what I am going to do with my life. Hmmrffff….. Enough thinking to my head explode with self-doubt, questioning and what if’s. Unlike my life choices, this dessert is anything but complicated. Crème Brulee has to one of my most regularly made desserts; creamy, comforting and crunchy. It is my dad’s favourite desserts and it gives me all the eggs whites in the world to make more macarons. 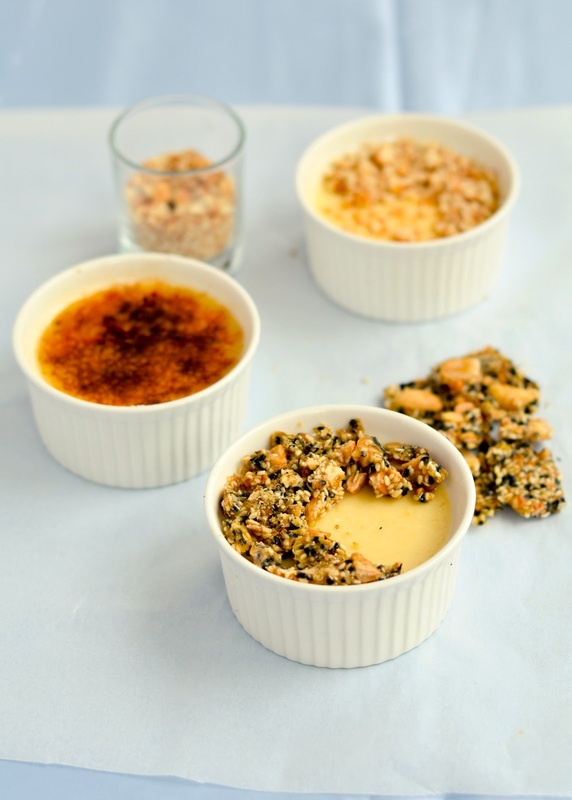 This simply is a baked silky custard which caters to a plate which like things not as sweet or as rich. You can serve this in three different ways. I adore Philippa Shibley and her desserts. 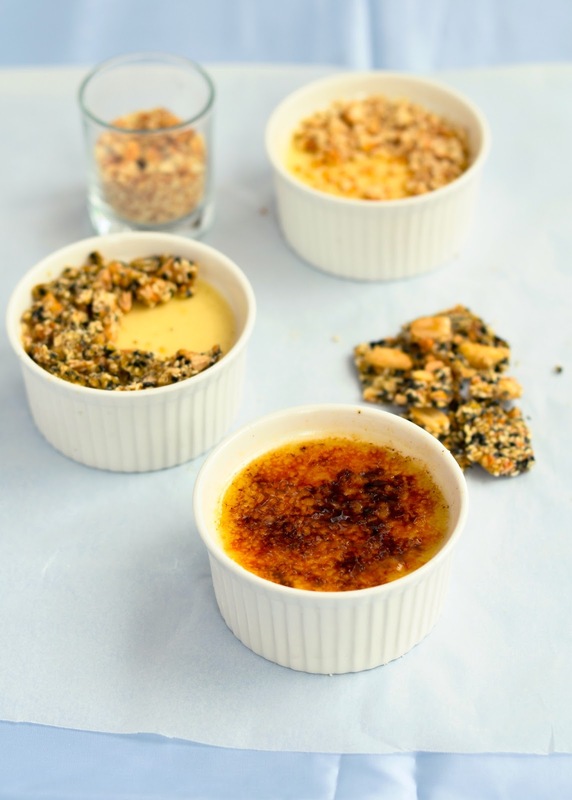 By taking the basic desserts and giving it new life by combining it on full dessert plates, the book I got this idea from allows you to do that at home! I am always looking for new ways to serve my favourite meal of the day. 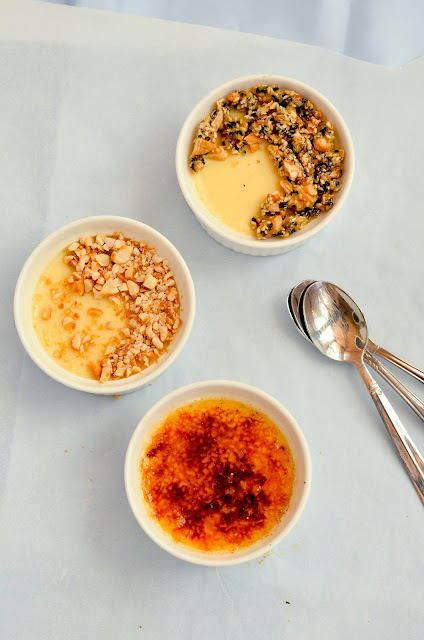 The crunchy nuts in Crème Cassonade provides a flavourfully contrast against the smooth custard. 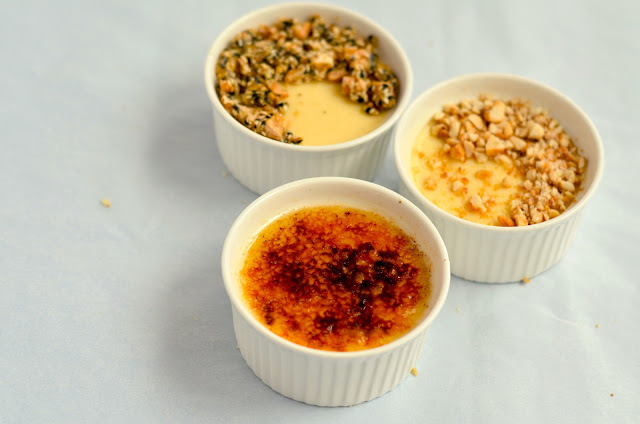 Baked vanilla custard is served warm or cold and finshed of with a carmaelised layer of oplain suagr or nuts and seed brittle. Toasted nuts are great but sugar coated nuts are better, also it give you an excuse to eat the left over brittle. 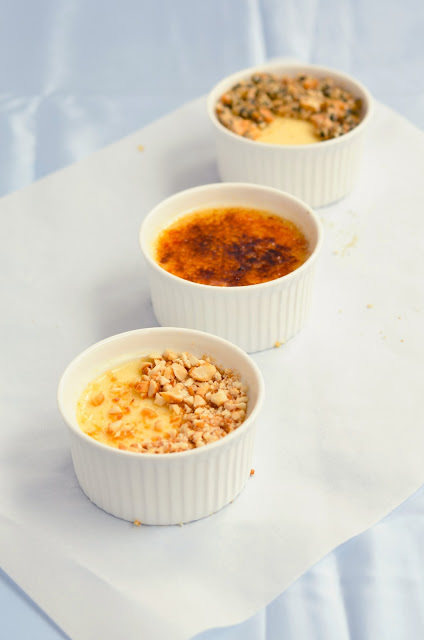 I think nothing beats the real deal of crème brulee, but this is great for people who love there nuts too. Place milk, vanilla pods and cream in a medium saucepan. Heat on low until it is just boiled. Leave to cool and infuse with vanilla pod. Whisk eggs, extract and sugar in a large bowl. While whisking pour the warmed cream/milk over the eggs in thin stream until fully mixed. 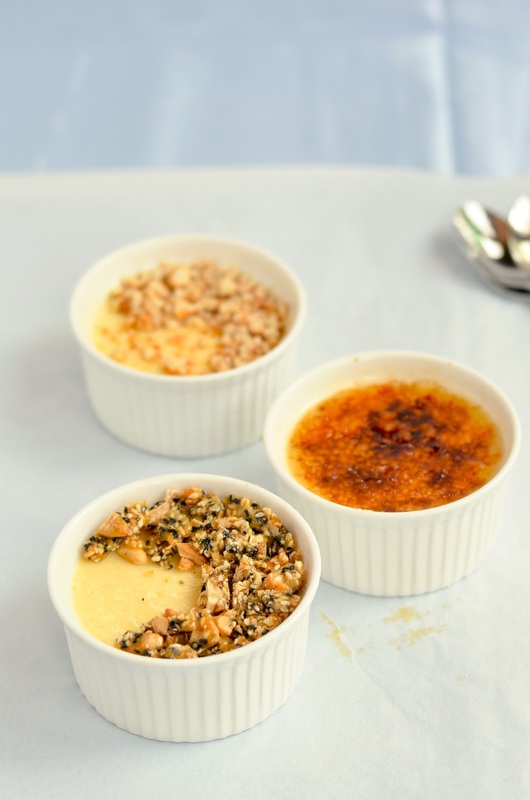 In large baking tray, place 6 bowls of choice and pour in crème brulee mixture. 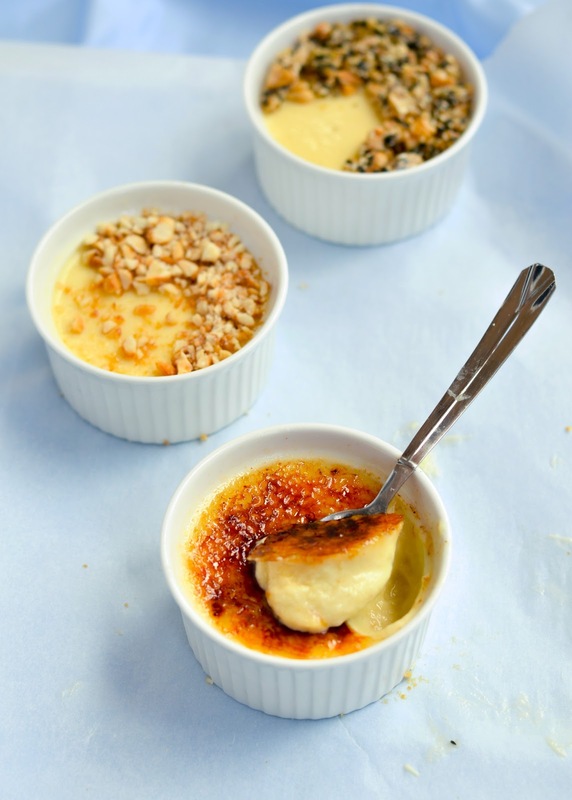 After pour hot water round the ramekins, be careful not to splash water in the cream mixture. Bake tray in oven for 30 minutes or until it set on the outside. It should be wobbly on the inside. Cool at room temperature and refrigerate until needed. 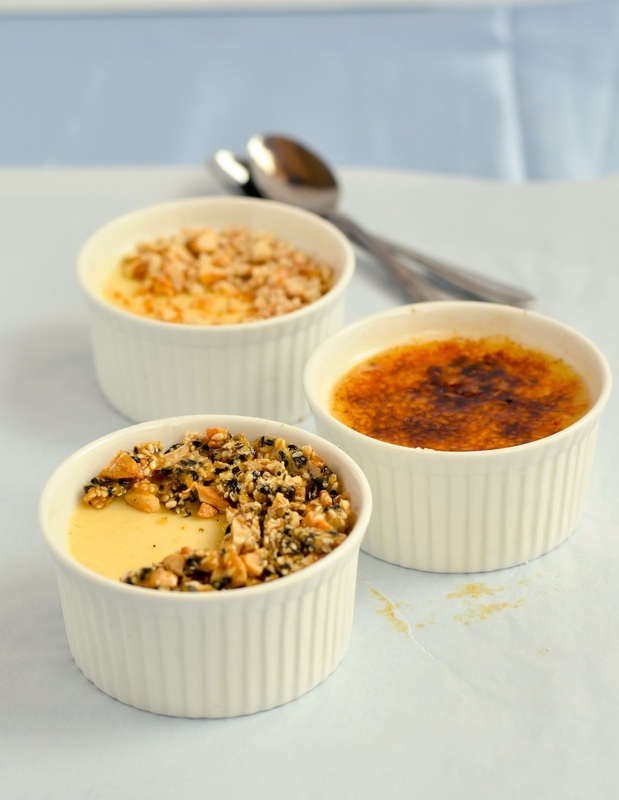 Crème Brulee: Top with caster sugar and use a blow touch to toast the sugar until a crackling crust forms. 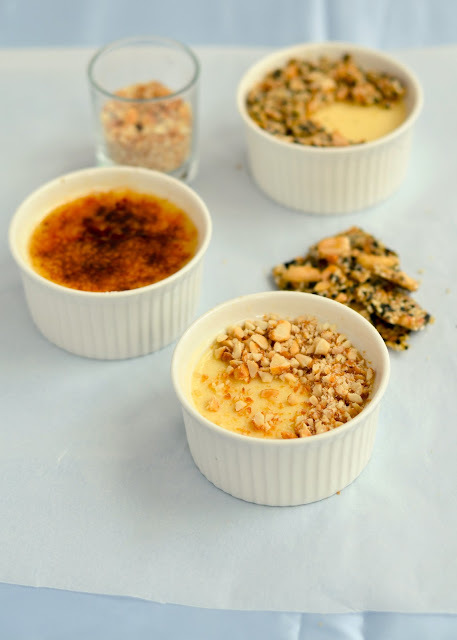 Creme Cassonade: Top with candied peanuts or Crushed cashew, white and black sesame brittle. Oh yum these look amazing!